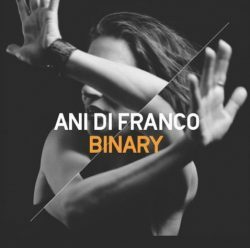 Singer-songwriter-activist Ani DiFranco has announced her twentieth studio album “Binary” which is set to hit stores and the interweb on June 9th. The iconic singer/songwriter/ activist/poet/DIY trendsetter returns to territory that brought her to the world’s attention more than twenty-five years ago now we’ve got another headcase in the Whitehouse. European Fans can pre-order the album now and exclusively in CD, and vinyl formats from Ani DiFranco’s PledgeMusic campaign page. Pledgers who pre-order the album will receive three “instant gratification” tracks and access to exclusive artist updates and bonus content. Fans will also be able to order special memorabilia including lyric books, t-shirts, screen-printed posters, totes, socks, signed guitars, and art prints. She’s also playing some UK/Ireland dates in June/July including Glasto. And here, dear readers, they are, along with the first single from her new album.